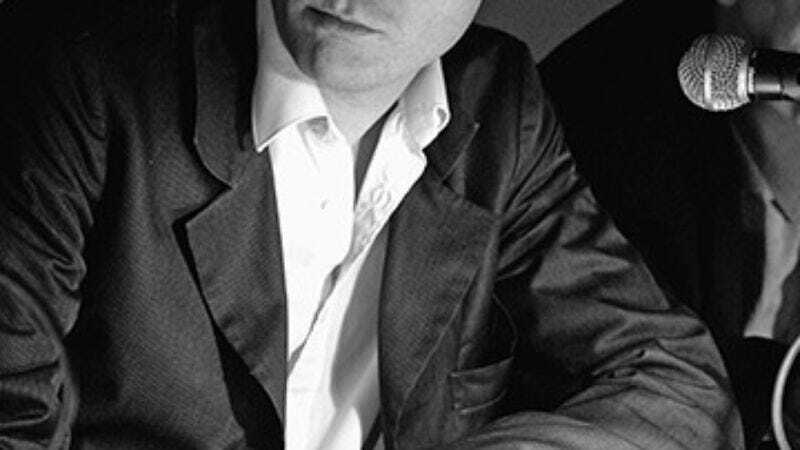 The shuffler: Tom McCarthy is an English writer whose debut novel Remainder is about a man waking up from a coma with a large financial settlement to spend and self-consciousness to burn. McCarthy is also general secretary of the International Necronautical Society, a self-described "semi-fictitious avant-garde network" in London. Tom McCarthy: I assume the title is a reference to W.B. Yeats, because The Fall are super-literary. Mark E. Smith was basically this working-class boy from Manchester who never had much formal education, but sort of came across Modernist literature in a drug-addled haze and really loved it. I've seen The Fall quite a few times. I mean, I don't go see that many bands, but one band I always go and see when they're in town is The Fall. Mark E. Smith is like the original classical figure of the poet—he's like Orpheus, you know, who's just halfway dead. He's got one foot in the underworld. He's just picking up some transmission on the threshold between sense and complete nonsense that might contain all these incredible words of wisdom, or might just be complete garbled rubbish. But you know, in Greek plays they have seers and oracles who always talk in riddles. I always get the impression that Mark Smith is like an oracle. TM: This is from Complete "B" Sides. I used to listen to the Pixies a lot, and I really like them. I lived in Prague in the early '90s, because it was cheap, basically. I could afford to live there and be a writer on very little money, and I'd listen to the Pixies. All the Czech kids were completely in love with underground and alternative music, even before the Revolution in '89. They'd apparently go to the British Council Library and sit there reading the NME—the New Music Express. The Pixies and My Bloody Valentine and Sonic Youth—this was what Western democracy was for them. One rallying point for the underground movement of the '89 Revolution had been this pirate radio station called "Radio Stalin," and they constantly played this sort of music. It was very much in the air. TM: As in [fabled occultist] Aleister Crowley. When I was 12 or 13, I got really into Ozzy Osbourne. In fact, the first live gig I ever saw was Ozzy. My family lived for a year in Palo Alto, California. All the kids at school were listening to Ozzy, and it was quite good for me because he was English and I was English, so they were like "Okay, cool. You're English, great." So Ozzy won me popularity. About two years ago, I picked up the album again on CD, and it's really, really good. And it's just so funny. All these bands, like Ozzy and Motörhead and Def Leppard and Iron Maiden, all come from this little ring around Birmingham, which is like the shittiest city in the whole of Britain. I don't know what the equivalent would be, maybe Cleveland or Flint, Michigan. It's just an industrial city gone into decline, and the last place you'd associate with culture or anything cool or good. And yet all these bands came out of it in the '70s. They were all like metalworkers and people who worked in the car factories. They just played in bands in their spare time. TM: The first time I saw Public Enemy was when they came over to the UK and appeared on some youth TV program. Flavor Flav has this huge clock around his neck—like an English Victorian gentleman would have a little watch—and I just really liked that. He was always holding it up to the camera and going "What is the time? What time is it? What's happening to time?" The association it had for me was William Faulkner, who I think is just the best writer. In his novel The Sound And The Fury, one of his characters, Quentin, walks around carrying a clock. The reason he's carrying a clock is ostensibly because it's broken and he wants to get it fixed, but really, the reason is, he wants to get out of time. He wants to escape from time itself, and Faulkner had listened to Einstein lecturing at Yale or Cornell or Harvard or wherever he was, and he got really fascinated by this idea that time isn't absolute and maybe you can sort of escape from it. In the book, Quentin carries this clock with him and he rides on all of these trams, which is almost sort of a parody of Einstein's idea that if you go really fast, time bends. And actually, Quentin ends up dead. But I was really into Faulkner, and I switched on the TV and saw this guy carrying around a huge clock. So I guess that's why I bought the album. That's my association with Public Enemy.